Yesterday when I tested the excellent Project Naptha OCR extension for Google Chrome, I noticed an additional line in the extensions manager that I have not seen before there. 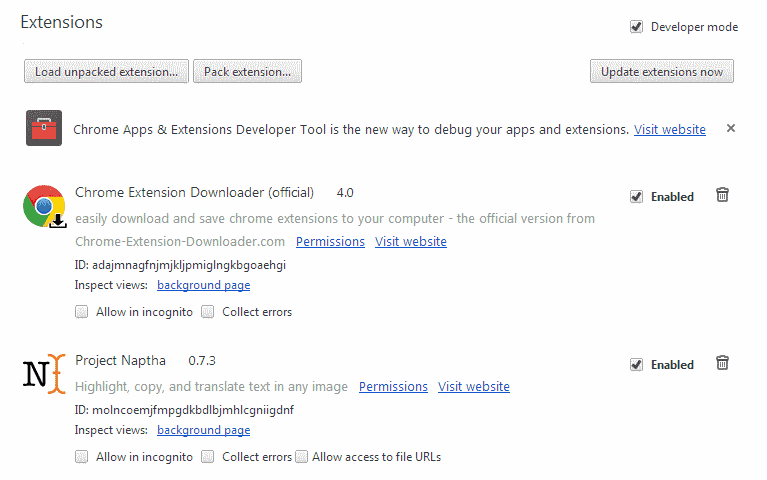 It read "Chrome Apps & Extensions Developer Tool is the new way to debug your apps and extensions. Visit website" and I first thought that it was an add injected by a third-party application on that page. It quickly became clear that this is not the case, as the visit website link leads to the Chrome Web Store, or more precisely, to Google's Chrome Apps Developer Tool there. So, it links to an extension created by Google. I checked Chrome Stable and it is not displayed there, only in the Chrome Canary version that I'm running. I do not know why it is displayed on the page, likely because I have Developer mode enabled and run Canary, but that is just a guess. The main issue here is that you cannot remove the information from the manager. Sure, there is an x icon, but it only removes it on that page. When I close it and reopen it, it is displayed again. When I close it and restart the browser, it is also displayed again. I classify this as an advertisement. Google advertises its new Chrome Apps Developer Tool extension this way in the Chrome browser to users who may or may not be developers. Some may say that it is the company's browser, and that it can do whatever it pleases. While that may technically be true, it sets a precedent in my opinion that is better stopped right at the beginning. What keeps Google from advertising its other services in Chrome, and eventually maybe even add Adsense ads to it? Mozilla received a lot of flak for populating Firefox's new tab page with three sponsored tiles out of the nine total tiles, which you can get rid of right away by the way. I have two main issues with the advertisement on the extensions page. First, it cannot be removed permanently from the browser. Why display a close icon there if it does not do anything? Second, it is an ad. Yes, it may be closely linked to the browser and link to a first-party tool created by the company itself, but it is still in essence an advertisement link. Note that you can hide the line if you disable Developer mode on the extensions page. It will hide it on that page, but once you enable Developer Mode again, it is displayed again in its full glory on that page. Google displays an advertisement on the Chrome Canary Extensions page. Honestly, I am not surprised. I saw it coming. Good thing I don’t have Chrome installed. Pls post a screenshot of it! He did; it’s on the page. You’re not seeing it because your Adblock is blocking it. Now it occurs in Dev version also!